To alleviate traffic congestion on I-10, ALDOT plans to build a new I-10 bridge across the Mobile River, adding lanes and creating a bypass to the tunnel under the river. There have been several proposed routes, some of which could have a significant impact on planned downtown waterfront developments and the maritime industry. A southern route could set a permanent height limit for cargo vessels and cruise ships that travel up the river to reach the state docks and cruise terminal. Pilings for the bridge could impact the operations of long-time maritime industries along the river. Does anyone have plans or info regarding the various proposed routes? Thoughts about if and where it should be built? -toll collection site is positioned in the way where nobody going into downtown is tolled (from either bay side) but everyone passing through is. -Use to existing tunnels as only Baldwin-Water St access. -going ahead and widening the bayway to 4 lanes each way. We must face it, it will happen, its just a matter of when and how. -Architectural design competition to be selected by downtown residents/businesses. Use any state monies already allocated for project for downtown investment to help offset any negative ramifications associated with bridge and purchase of ferries. I oppose it being a toll bridge. I agree there needs to be more money spent on surface streets in the city, but this is part of the interstate system.... it doesn't need a toll. Well ultimately I think the whole system can and should be tolled. Those of us who use it pay for it, those of us who stay in Midtown and off the highways dont. Thats about as fair as it gets. I am tired of subsidizing sprawl. I agree with the "usage tax", but only if it's country wide..... not just one bridge in L.A. I think the interstate system is one of the best ideas the US has ever stolen, but it has had a lot of unwanted side effects...... like the nationwide sprawl trend. The sprawl is leading to defacto segregation (inner city schools mostly minorities and the schools in the sprawl and county mostly white) which has it's own set of problems. 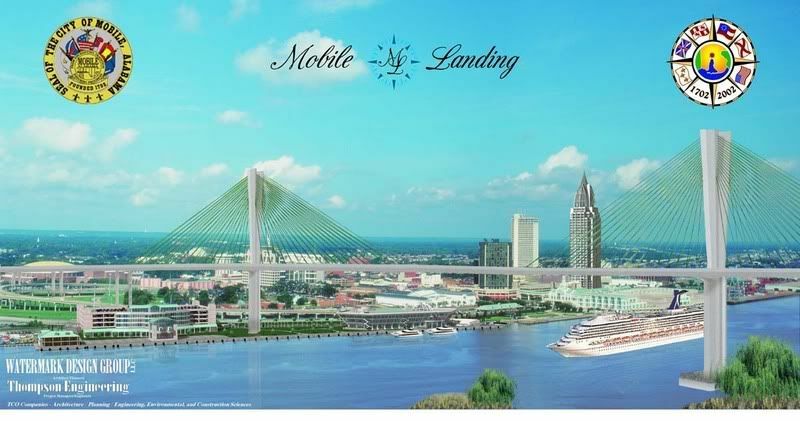 Keep Mobile Moving, an organization founded by three of the city's largest shipbuilders, hired a traffic consulting firm and developed an alternative to building a new bridge. The new bridge could cost the maritime industry $250 million per year and bring about the losses of hundreds, even thousands, of jobs. The alternative proposal would reroute I-10 truck traffic to I-65 and I-165, away from the tunnel. Improvements to the state's Intelligent Transportation System would alert I-10 drivers to traffic problems so that they could take I-65/165 to avoid delays. I-65 and the Bayway would be widened and the roads leading to and from the Cochrane-Africatown Bridge would be four-lane with limited access. The proposal would cost $462 million, compared with $650 million for the bridge. All those changes would cost a LOT more than $462 million. I guess I fail to see the big problem with the current locations for the proposed bridge. It looks to be a large suspension type bridge that will have only a few bridge pylons in the ship yard areas. I personally think they are just whining. I'm sure there will be some loss of money and inconvenience, but a couple of bridge pylons isn't going to cause a 50% ($250M) decrease in shipyard revenues. I read an article in the paper about how the proposed bridge may affect the cruise business in Mobile. There are already 40 ships that wouldn't fit under the 160 foot span that is now on the drawing boards. The 210 feet that austin mentioned sounds like a better plan. Even though the length of the ships capable of docking at the cruise terminal is also hampered by size of the turn basin, IMO the 160-ft span would be a bigger player in Mobile's chances of getting a bigger ship. my goodness they are considering a 160 foot bridge? That is absurdly low and show never be built. Regardless of downtown (just imagining this bridge was going up next to nothing) I could never support anything less than 190-200 feet. That would devastate the area, and it should not even be up for consideration. They should whine, not about the bridge, but about its proposed height, if the proposal really is 160ft. Maybe they know the 165 route is a no go, and are just trying to position themselves for a compromise which is a more expensive higher bridge. And I also agree, those changes will cost alot more than 462m. Aldot cannot do anything effective for that cheap. I remembered wrong, it's 190 feet. Still, there are 40 cruise ships that wouldn't fit under the bridge. I know it would be later rather than sooner that Mobile would get a ship of this size, but always plan for the future. The bridge alternative report, prepared for Keep Mobile Moving by the Street Smarts firm of Atlanta, is available here in .pdf format. Wish i had a map to show this . what if I-165 split ? the way it is now. going to downtown , and a new bypass headed east from I-165 south to the Cochran Bridge , after it geauxs over the river , extend it to merge with the bayway. Which needs to be 8-laned all the way to the malbis exit. Haha, it sounds like one of those, full spead ahead wack the trees down and build at all costs, kinda jobs. The idea you suggest is the ideal one, but, also the unrealistic one. I'm not familiar with the area, but, wouldn't that require a lot of relocation of companies, industry, and business? Ahh....no . ITS north of everything. Want u come visit us sometime. Don't worry I will. The area is so beautiful. I agree; most of the people using the bridge would be out-of-towners and those who have contributed to the sprawl. Most large spans such as this one are tolled, and there will be a free alternative in the Wallace and Bankhead Tunnels if one would rather not pay the toll. If the bridge is to be a suspension bridge, then there has to be room on each end of the bridge for the large anchorages that hold the deck-supporting cables at maximum tension. Didn't the plans call for a cable-stayed bridge instead of a suspension bridge? A cable-stayed bridge would not require any anchorages. Still, to avoid putting any of the pylons in the middle of the Mobile River one would have to be placed on either side of it. The approaches to the bridge would also cause some of the shoreline to be cut off from the rest of the city. I would love to see exactly what kind of footprint the current proposed bridge would have. Another bridge proposal is mentioned here, although this one by Hank Cobb is unlikely to be considered. "From the I-65 merge with I-10 travel straight-line easterly to the Broad Street overpass and (on the straight ahead rising approach ramp) go up and over the McDuffie Coal Terminal, cross the bridge over the tip edge of the mouth of Mobile River, come down over Pinto Island south of the Battleship Alabama and merge into the new Bayway in the center of the Bay." This bridge would have river clearance of 360 feet, far higher than the ALDOT proposal, and would not have an adverse affect on the maritime industry or downtown developments. It would cost $800 million-$1 billion, more than the ALDOT proposal. I am surprised that no one has given a more southern route any consideration. A southern bridge would also give the chance to build a truly magnificent bridge that would serve as an icon for the city of Mobile. I think the cost is the largest factor here, but if the bridge is tolled, then a portion of the cost would be covered. You know that would be the tallest river bridge in the world right? The largest in the US is the VZ Narrows in NY at 228ft. I had no idea. Wouldn't that be something for Mobile? Something is going to have to be done to get ALDOT to consider something other than the current waterfront proposal. Mobile can't afford to kill the goose that laid the golden egg by damaging the maritime industry. Even a bridge with a height of 190 feet won't be high enough in the long run -- container ships are getting taller and taller. Several maritime firms will be put out of business or forced to limit their operations if that bridge is built, and this is simply unacceptable. At least build it 220 to 230 ft tall. I think people might be scared to ride over it but if it works. I think they should consider different options too. Keep Mobile Moving put together a presentation about their alternative to the new I-10 bridge, which would put waterfront economic activities in jeopardy. As John Lehman, former Secretary of the Navy, said to the Mobile Press-Register, "Mobile should not sacrifice a strategic asset (the Port) to solve a current problem (traffic)." The presentation is available in .pdf format at this link. According to that presentation, the eastern interchange of the proposed West Mobile Bypass and I-65 will apparently be constructed in Chickasawbouge Park.